Colour: Dense inky black with purple tints. Bouquet: Toasty integrated oak, blackberries, briar, black pepper and spice. Palate: Multi layered concentration of very rich, juicy, full-bodied black-berried fruits combined with chocolate, tar, pepper, liquorice, smoky oak and chewy robust tannins. 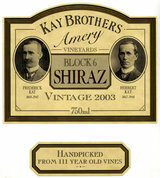 An intensely complex mouthful of Shiraz fruit with a finish that lingers and lingers. The rich fruit carries the 15.5% alc/vol and we would see this Block 6 developing into a great example of old vine Shiraz with 6 years plus in a good cellar. Polished, generous and appealing for its cascade of blackberry, plum and sweet spices that linger on the finish. Hints of chocolate and espresso as the finish sails on and on. Has miles to go. Drink now through 2015.